I would like to use ESP32 to speed control my AC ceiling fan which is 220V AC 100 W.
Will the below AC dimmer work with ESP32 to speed control the ceiling fan which is 220V AC 100 W? If not, kindly suggest a commonly used PWN dimmer that works with ESP32 to speed control ceiling fan with 220V 100W? This is the link to Speed controller available on Amazon. In theory, it should work to control the speed of fan. The manufactures description mentions "fan regulator". One of the pictures shows on the backside of the module that it is for 2 A (5 A peek). This should be good for 230 V / 100 W motor. 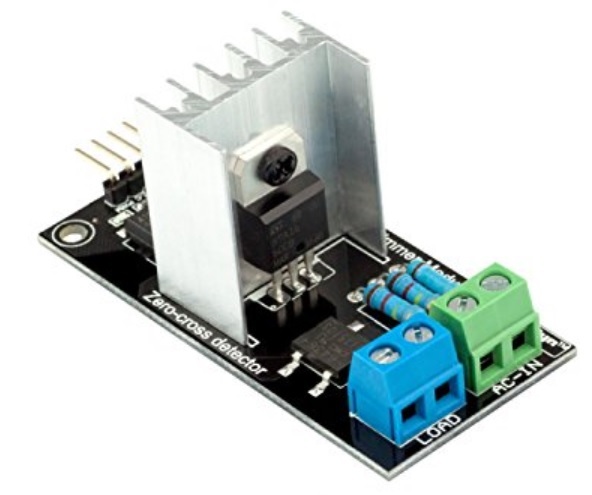 The module gives you a basic circuit to control AC. It reports zero-crossing and has an optocoupler switch to turn AC on and off. The dimming does your sketch, by cutting parts of the AC wave out in precise timing. The example sketch is not good. It has delay in interrupt. With this implementation the sketch will not be able to do much else. Not the answer you're looking for? Browse other questions tagged motor esp32 speed or ask your own question. How do I set a 25 kHz PWM signal on an ESP-WROOM-32?